“Their third. Their best.” The advert’s assertion was blunt, a brusque collision of commercial and artistic imperatives, but few agreed, then or now. Possibly including me. Of the Only Ones’ three albums, the middle, 1979’s Even Serpents Shine, is often pushed forward as their masterpiece but there are three places on a podium. Serpents… lunges over the line powered by a higher consistency than its siblings, while the first, eponymous album, is noticeably more uneven but will always be distinguished by having by far the best known Only Ones song, Another Girl, Another Planet, rightly famed for its cardiovascular propulsion, John Perry’s skyscraper-scaling solo and its impeccable timing in unravelling itself in exactly three minutes. As it wasn’t a bona fide hit, apart from reaching 17 in the 1978 Festive 50, it was an albatross they were able to wear comparatively lightly in their lifetime.The dead hand of mythology and the deadweight of telecoms advertising would increase the pressure years later but, more than probably any other supposed one-song band, the Only Ones were nothing of the sort. Perfect as it is, Another Girl… was just one arrow in a quiver packed with swift, lethal bolts – Lovers Of Today, City Of Fun, The Beast (notwithstanding Motley Crue later -surely unwittingly – duplicating its riff on their horrible, even by their standards, Girls Girls Girls) Flaming Torch, Miles From Nowhere – and a sizeable proportion of Baby’s Got A Gun, which here gets the leg-up that posterity has too often denied it. It’s a simplistic sketch to say the least but if there was ever a British answer to Television, it was the Only Ones. Skilled musicians with too many miles on the clock to be strictly punk (as well as Perrett’s prehistory with England’s Glory, bassist Alan Mair was a mid-60s veteran of Glasgow band Beatstalkers, whose hometown appearances sparked riots before they’d so much as issued a record and were the subject of at least three front page splashes in the city’s Evening Times in 1965-6, while late drummer Mike Kellie had seen quite different service to the Only Ones in Spooky Tooth) but more than enough internal combustion to be as near as dang, an Impressionist painter’s exquisite craft and dissolute demeanour, singers pouring their hearts out in steady trickles – the pieces mirrored each other like the coasts of Africa and South America. In Peter Perrett, the Only Ones had a frontman whose weary disposition belied a heart that sparked and crackled like all the world’s cities on New Year’s Eve. Second only to Syd Barrett in unequivocal Englishness, his speciality was to make the most straightforward and heartfelt romantic declarations, offset by further pronouncements that were either self-lacerating or simply peculiar, like these masterly and flawlessly delivered lines from Lovers Of Today: “If we ever touched, it would disturb the calm/Physical exertion often causes mental harm/I don’t have the energy/You could say things get pretty tranquil with me/Maybe you can’t see that I love you, baby/Much more than me.” Ardour and desire, tempered by a fragility possibly linked to Perrett’s long-running problems (more than enough said about that elsewhere, nothing to add here; some of his his many face-value love songs could well also be metaphors, though he recently maintained they weren’t all about one thing) but also the product of an emotional candour which is there in plain view anyway. It’s there on Baby’s Got A Gun’s opener, The Happy Pilgrim, where Perrett’s Canterbury Tale, initially, couldn’t be clearer, or more tender: “I’m gonna give it to you, all the love that’s in my heart/I’m gonna give it to you/We’ll never part, you and me.” But then: “Take me into your heart/Protect me from myself…Keep me safe from evil…I’ve had enough of tragic people.” Suddenly, the love song of promises has turned into a prayer of pleas but it’s such an abrupt volte-face that you end up wondering if there’s a proto-Morrissey wink in Perrett’s eye. It’s likely the Bard of Stretford was listening; it’s almost certain that Johnny Marr was too, with this song’s subtle yet vigorous trajectory finding echoes in him a few years later; it also has more than a few contemporary ripples towards the Jam. The same rock’n’ romanticism is in Reunion, where Perry’s cocky riff builds a seemingly unlikely bridge between the south bank of Sweet Home Alabama and the north bank of Dum Dum Boys. It sounds celebratory but Perrett’s heart is mourning: “I had so much love inside me/I don’t know where that feeling’s gone/I’m mortified by this recurring dream.” The reunion seems to be either a distant memory or a remote possibility, even as his sister-in-law, Koulla Kakoulli, chimes in on what are not so much harmonies as shadows. Trouble In The World charges in on a steed of a bassline from Mair as the band fashion an edifice from a couple of rock’s sturdiest pillars, with Perrett and Perry pulling blades like Richards and Jones on the Stones’ version of I Wanna Be Your Man and Perrett unpacking a prime Dylan delivery. It starts as one of his gloomiest lyrics: The ‘Trouble’ is the final inevitable and, as Nick Drake did on Pink Moon, he reminds the biggest and the toughest that they won’t wriggle free either: “If you do happen to be stronger/It only means you’re gonna take longer to go under.” Later, though, he seems to find at least some hope, pleading: “Don’t be scared to have children” and making it the only song I’ve ever come across to include the word “preordained.” Please let us know if you’re aware of any others. Fools is a duet between Perrett and Pauline Murray, who had recently split Penetration and was putting together her one brilliant album with the Invisible Girls (aka, among others, Martin Hannett, John Maher and Vini Reilly). The single from the album and a rare cover – of a song by country singer Johnny Duncan – it could have been only a Radio 2 whim away from becoming a hit, though you would never have had the people who previously sang Language Problem and Firing Squad gazing gooily at each other as they harmonised. Even so, it foregoes the saccharine that blights country at its worst and tells of a love that seems at best ill-advised, at worst illicit or mutually destructive. Then there are the two longest songs, which occupy opposite extremes. While Me And My Shadow is the album’s one real misfire, its Diddley skeleton poking too visibly through the flesh of a somewhat ungainly, overlong song, the Big Sleep is its centrepiece. The Chandler-derived title again hints at mortality but it’s something Perrett has been rescued from. For what, though? He insists it’s love but “you taught me how to think cheap…there’s no such thing as glory…I don’t have the strength to break an empty shell.” It’s no good for him but it’s what he wants and the turmoil boils over in a melody that rolls endlessly like the boulder of Sisyphus, up one hill trod earlier on Roxy Music’s In Every Dream Home A Heartache and down another trod later on REM’s Camera. 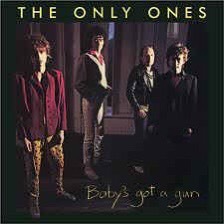 “They’ve made this album before, though not necessarily in this order,” said David Hepworth – paraphrasing Eric Morecambe – in his Smash Hits review of Baby’s Got A Gun. This lukewarmth would take hold as the shadow of Another Girl’… grew ever longer in the public imagination and the album would dwell – if it dwelt anywhere – in the answer to the pub quiz question about albums which don’t feature their title track (other residents: Waiting For The Sun; Houses Of The Holy; World Shut Your Mouth; Screamadelica; Sheer Heart Attack). But only a little scrutiny reveals a record of joy in the face of horror, defiance in the face of meanness, a battle for redemption in the face of ill-will. Perrett has now finally prevailed and, after a couple of false restarts, delivered a fine solo album, How The West Was Won, but even if none of the Only Ones had been heard of again after they came to an end in 1981, their stamp had already been left. It is – as they put it themselves – The Immortal Story (PG).